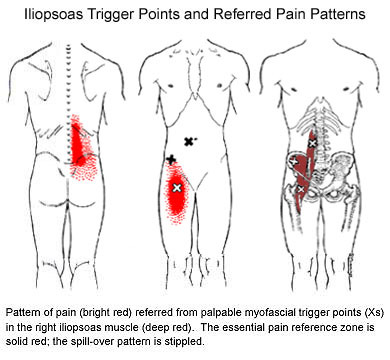 Iliopsoas-related back pain is the most common single pattern seen in my practice. Most cases resolve in one visit, but occasionally more visits are required. Back pain without an abrupt onset requires the patient to stretch on a regular basis to maintain his recovery. Source: Travell JG, Simons DG: Myofascial Pain and Dysfunction: The Trigger Point Manual, Vol. 2, Williams & Wilkins, Baltimore, 1992, p. 90. Reproduced with the permission of Lippincott Williams & Wilkins. Symptoms: Pain in a pattern lateral to and parallel to the lumbar spine and/or in the S/I joint. Pain may be unilateral or bilateral. Pain may occur with sitting, standing, lifting, getting out of a seated position, and/or walking up stairs. Patient cannot lie down comfortably without support under the knees. Signs: Hip extension is restricted and may be less than zero. Extreme lumbar lordosis. Patient may limp. Patient may be unable to stand straight. Degenerative or herniated lumbar discs may be present. Tandem Point approach: Psoas and iliacus trigger points with Sp 9, Sp 8, Li 6, Sp 6, Ki 4, Ki 5, Sp 5, Li 4, Sp 4, P4, P5, P6, Bl 60 and Sp 21. The patient presses a psoas trigger point near the navel and Sp 21 or any referred pain point on the low back. Release trigger points in any of the following antagonists: piriformis, gluteus maximus, gluteus medius, gluteus minimus, with Bl 61, then release the psoas again. Stress the iliopsoas by having the patient walk up stairs. Repeat the approach. Sometimes trigger points in the rectus femoris limit hip extension, and those points need to be released as well. When the rectus femoris is in contracture, it must be released along with its antagonist, the biceps femoris. Occasionally psoas minor will play a role in this pattern and is released with Ki 5. In advanced patterns, where the patient has been suffering significant pain for a long period of time, it may be necessary to alternate work on the anterior and posterior sides of the body several times during one session. Also, it is important to release muscles on both the left and right sides of the body, even if pain appears only on one side. Cases: The following cases display some of the assorted causes and courses of iliopsoas-related back pain, and some of the combined syndromes often seen. Female, 45, nurse. Her account of her injury, August 13, 1999: "I fell backwards over a suitcase and landed flat on my back, with the impact evenly distributed. It took my breath away and I instantly felt pain in my flank and low back. I don't remember any radiating leg pain. I immediately iced my back for several hours and took Advil fairly regularly (600mg every 4-6 hours). Hours later when I tried to go out for dinner, I could barely manage to walk. The pain was intense in my low back and around my hips. I tried to sleep, but fitfully. The next morning it took all my effort to get out of bed and walk -- stooped over -- to the bathroom." Tandem Point therapy was applied about 10 a.m. August 14 and was limited to work on the iliopsoas and related tandem points. No points were taken on the posterior side of the body. Her account: "I could immediately walk, straighten up and most of my pain was gone, except a little stiffness for a few days. Stretching helped, too. Since then [as of March 1, 2000] I have tried to 'find those points' when my back is sore or stiff from moving boxes or furniture, but I can't remember the exact stretches." Female, 45, nurse. History: Patient suffered a low back injury in 1993 (pain in the left sacroiliac joint) while lifting a patient in the hospital. M.D. referred her to physical therapy. She did not find PT helpful and only went two times. She received Tandem Point therapy for her low back on February 1, 1999: iliospsoas plus Ki 4, also gluteus medius plus Bl 61. Immediately following therapy she had no pain in her left S/I joint. She stretched her psoas and gluteus medius irregularly for a few weeks. On February 21, 1999, she reported no pain in her left S/I joint. She started working out in May, 1999, and developed pain in her right S/I joint, which was addressed in her next two sessions. [This case indicates the importance of treating both the left and right sides of the body whenever time permits, even if the pain appears only on one side.] Follow-up treatment: November 11, 1999, Tandem Point therapy addressed psoas muscles briefly, as well as other pain problems. Follow-up by phone: March 8, 2000: the patient had just gone cross-country skiing; she had no pain in either S/I joint; her low back is "fine." She now does assorted yoga stretches daily. Female, 24, medical research professional. History: Patient had injured her low back in 1992 rowing crew. She was diagnosed with a lumbosacral sprain. She received muscle relaxants and three months of physical therapy, which did not have an effect on her back pain. She reinjured her back in the spring of 1993, when her dog ran into her and knocked her on her back. Her back pain eventually went away. She awakened July 20, 1999 with acute low back pain. The patient called in sick to work because of her severe back pain. Sitting and rising from a sitting position were especially painful. Her pain extended along her lumbar spine to the top of her S/I joint. The patient was seen on July 20, 1999, at 1 p.m. Tandem Point therapy was applied to the iliopsoas only, with Sp 3, Sp 4, Sp 6 and Ki 5. At the end of 45 minutes of therapy, the patient reported no pain. The patient went on a camping trip that weekend and had no pain. The patient was seen for neck pain on September 27, 1999, and she reported her back was "totally perfect." Follow up by telephone on March 5, 2000: the patient stretched her psoas for about five days after her injury but has not continued to stretch. She has had no back pain since July 20, 1999. Male, 36, dancer in professional dance theater. The patient suffered an injury in early October, 1999, caused by "stretching from standing still" during a photo shoot. The next day he had some pain, and it grew worse during the week. The patient had pain sitting, walking up stairs, lying down, and sleeping. He felt pain in his groin and in his low back. The patient telephoned his doctor and was referred directly to physical therapy without a doctor's visit. His two physical therapy visits "helped a little." The physical therapist provided him "good exercises, but nothing that fixed the problem." The patient was gravely concerned that he would be unable to accept an upcoming dance role that was being developed with him in mind. He presented for Tandem Point therapy on November 21, 1999. Therapy involved: pectineus plus Ki 20, Ki 27, and Ki 5, and later St 30; iliopsoas plus H 7 and Sp 8; gluteus medius, gluteus maximus, and tensor fascia latae. Following this session, he reported that about 85% of his pain was gone, and three days later he was able to dance. Follow up treatment January 11, 2000 involved Tandem Point therapy for the pectineus, psoas, quadratus lumborum, and tensor fascia latae. After this session, 100% of his pain was gone. His dance performances were in February, 2000, and he noted that during the first week of performances the theater was very cold. He had some pain, which he relieved with self-acupressure to psoas major. During follow up treatment February 22, 2000 his psoas was treated again, with Sp 22, Bl 60, and Li 4. Male, 42, attorney. History: Low-back pain onset mid-1980's (15 years duration). Symptoms: Periodic severe spasms required him to spend a couple of days in bed. These spasms would happen once or twice a year and were getting worse through the years. The spasms would come on unexpectedly, but usually involved some sort of bending motion. At the most extreme he was unable to move. He had to work at a "standing desk," because he could not sit down for extended periods. Tests by M.D. : X-rays and MRIs. Diagnosis from M.D. : degenerative disc L4-L5; L5-S1 disc worn down to almost nothing. Treatment before Tandem Point therapy: physical therapy that only included exercises, which helped somewhat. The exercises emphasized strengthening rather than stretching. Because the patient kept having episodes of severe pain, his M.D. prescribed a TENs unit, which the patient used for "a little while." At one point a physiatrist tried acupuncture. The patient also tried massage, chiropractic, exercises and stretching 30 minutes/day, including sit-ups. The patient presented for Tandem Point therapy May 23, 1999. Tandem Point therapy was applied to soleus trigger point 3 plus Ki 4, gluteus medius plus Bl 61, psoas plus Li 4. At the end of this session, the patient had no back pain. Follow up treatment June 20, 1999: The patient and his family were moving to the Midwest. The patient had been lifting a lot of boxes, and he had just started to have some pain. Tandem Point therapy was applied to the soleus, semitendinosus, semimembranosus, gluteus medius, gluteus minimus, psoas plus Li 6, and quadratus lumborum. Patient has no back pain at the end of this session. Follow up by telephone on February 13, 2000: His back was "doing OK." He had one episode since he moved to Midwest, playing tennis. He leaned down to hit a low ball, then had to spend a lot of time lying down, and he had to cancel teaching class. He has been feeling pretty well the last several months. He is doing a variety of exercises, stretching his abdominal muscles more, including doing Travell and Simons's stretches for the psoas, and stretches for the hamstrings. He still does sit-ups. Mostly he works standing up, but he can now work sitting down. Tandem Point therapy "helped tremendously, . . . brought immediate pain relief, which was great . . . .The most important thing was helping me to understand what was going on with it, so I was better able to take care of it." Female, 52. History: Injury occurred three years previously after a long, hard, mountain bike ride. Her chiropractor thought she had suffered a "bulged disc." She had a lot of discomfort for several months, during which she could not sit for any period of time without discomfort. She did not perform any exercise or stretching for almost a year. Later she found that stretching actually was the only thing that seemed to help. She first presented August 24, 1999 for Tandem Point therapy for neck pain and headaches. At her second session, September 9, 1999, she received Tandem Point therapy for psoas minor, psoas major, and the piriformis, including holding a point in psoas major with a point in the piriformis. Follow up March 7, 2000: She reported that Tandem Point therapy "made a huge difference" in her low back pain. While the discomfort still comes and goes, she can now use pressure points and stretching to make the discomfort go away. She estimates that she has 50% of the pain she used to have before one session of Tandem Point therapy for the low back.